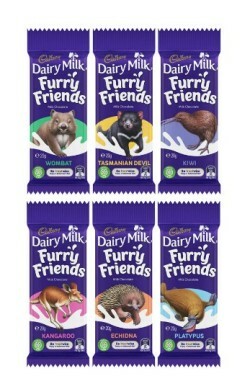 Cadbury Dairy Milk Chocolate packaged displaying 6 iconic Australian and New Zealand animals. Among those available are the Wombat, Tasmanian Devil, Kiwi, Kangaroo, Echidna and Platypus. When placing an order you are welcome to leave notes regarding a preference of animal and we will do our best to provide you with your given selection. Milk, Sugar, Cocoa Butter, Cocoa Mass, Milk Solids, Emulsifiers (Soy Lecithin E476), Flavours.